In 2003, the world was introduced to the Glock-version of the .45 Auto in the .45 G.A.P. – a Glock-made cartridge with smaller, shorter .45 caliber rounds designed to fit into a more compact handgun while still providing the same stopping power as standard .45 auto rounds. That more compact .45 hand gun was the Glock 37, a firearm that accomplished incredible things and represented another notch in Glock’s belt of revolutionary gun developments. The Glock 37 provided the stopping power of the .45 Auto with the ergonomics of a more compact handgun – ideal for officers who do not favor the larger builds of traditional .45 Auto guns. 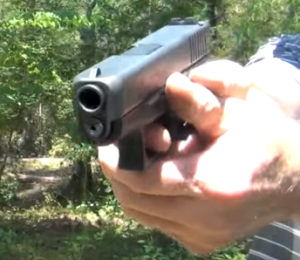 In typical Glock fashion, however, the G37 was not enough – law enforcement officials and private citizens alike wanted a .45 GAP-using handgun to match the size of guns like the Glock 19, 22, 32, 26 (also covered here), 25 and 33. 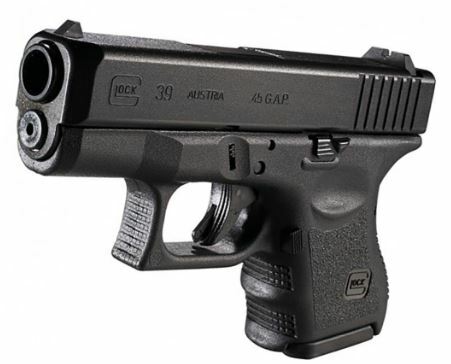 Compact and subcompact versions of the gun were necessary in Glock’s eyes in order to help make the new .45 GAP (Glock Auto Pistol) caliber even more accessible to gun enthusiasts. 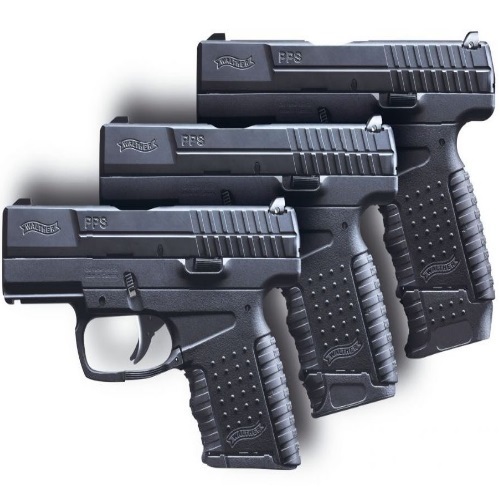 These necessities would become the Glock 38 and the Glock 39 – the official compact and subcompact versions of the Glock 37, and two of the best guns in the Glock lineup. Over time the .45 GAP has fallen slightly out of favor, and ammunition for other Glock’s is more easily found, but that doesn’t take away from the Glock 38 and 39 providing two of the best combinations of stopping power and form factor that the world has ever seen in handguns. Corresponding in size to the Glock 19, 23, and 32 pistols, the Glock 38 would qualify for ‘midsize’ labeling in terms of its dimensions and build. The Glock 39, on the other hand, is more of an ultra-compact handgun, best for those with small hands or who intend to use the gun for deep concealment purposes. For general concealed carry purposes, the 38 is ideal – small enough to conceal, but not so small as to fit better as a deep concealment weapon, like the Glock 39. Both the G38 and G39 also embody the traditional Glock makeup that has been seen time and time again – striker-fired action, simple design utilizing a small number of parts, world-class polymer build, etc. I have to say, I can’t imagine a better build for a gun than that of polymer, the material just feels good in hand to me and I don’t think you can put a price of reliability and durability. The aesthetic of the guns is also in typical Glock fashion – whether or not this is considered a positive thing is dependent on the user, but Glock’s are obviously built to work and work well – not necessarily look good doing it. I find the Glock 38 easy to handle based on its size being the most ideal fit for my hands, as well as its shooting performance. The trigger felt heavier than its listed 5.5-lb pull weight to me, but the gun still performed remarkably well given the high caliber of the .45 GAP. As I expected, the Glock 38 was just slightly more difficult to handle than the Glock 37, unsurprising given the smaller form factor of the gun. Nevertheless, it still handled well and featured a very manageable level of kick, or recoil, when firing. That’s really how things break down when it comes to the entire line of Glock .45 GAP-utilizing handguns – the G37 is the largest, easiest to handle, and most difficult to conceal, and these factors adjust accordingly when we move down the line to the smaller Glock 38 and smaller yet Glock 39. The Glock 39 is a bit less manageable for me personally based on its extreme concealed-form accommodating size – again, my hands are of the mid-range variety – so not only is the grip less than ideal, there is a tangible step up in the level of recoil as compared to the Glock 37 and 38. You will feel this in your wrist, but this doesn’t make the gun difficult to handle, per se – we’re talking strictly relative to the performance of the other, larger .45 GAP-using firearms in the Glock family. In a general sense, the G39 is downright easy to handle – only when compared to other, larger, world-class Glock’s do you notice the kick of the gun. Both the Glock 38 and the Glock 39 performed well in target shooting and accuracy testing – both guns held up well after firing 500-rounds, and both guns kept ten-shot groups from 25 yards to 4.2 inches at worst. The Glock 39 was obviously slightly less accurate, as you would expect, but it was almost more impressive when you consider its size. 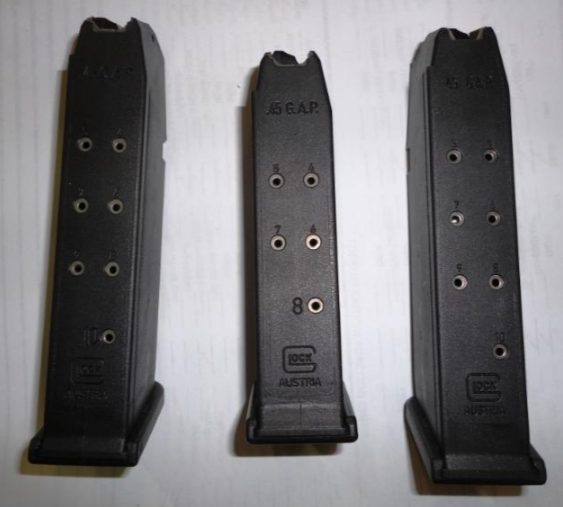 The Glock 38 magazine capacity sits at 8 – two fewer than the standard 10 featured in the Glock 37. There is the option to select an extended capacity 10-round mag, but that is something that I will never for the life of me understand. It’s one thing to pick up an extended mag for the sake of having it around, but what’s the point of perpetually using an extended mag which increases the level of bulk in the gun to what is virtually the same as the Glock 37 and its standard 10-rounds? Why not just purchase the Glock 37 to begin with? Gun owners aren’t always the most logical people. In any event, the 8-rounds are standard, which works well enough for me and my utilization of the G37 as a self-defense gun and a home defense gun. This same exact conundrum applies to the Glock 39 and its standard 6-round magazine – for any gun owner who is on the fence about an 8-round magazine, I would imagine 6 is out of the question. However, I need to reiterate and stress the misguidedness behind using a G39 with an extended magazine with any kind of regularity – at that point, it truly makes more sense to simply procure a larger handgun. 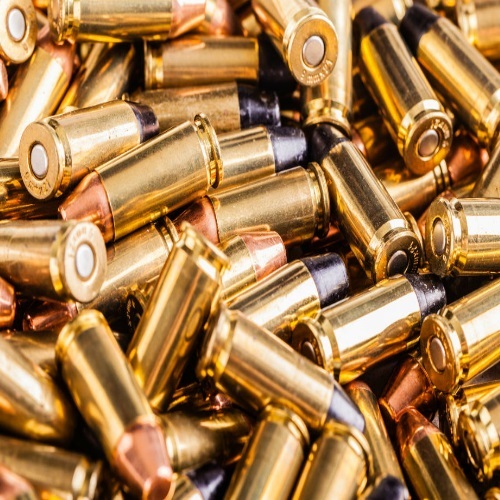 One of the main complaints when it comes to the .45 GAP-using line of Glock handguns is the lack of options and availability of .45 GAP ammunition. 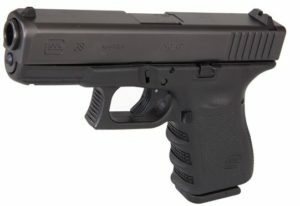 This what I would call a ‘first world problem’ – the most popular Glock handguns, like the Glock 17 and the Glock 19, enjoy such an enormous variety of options in terms of ammunition which can be found virtually anywhere, that expectations are unfairly high when it comes to Glock guns in general. Obviously .45 GAP ammo won’t be quite as easily found as standard the ammo of Glock’s 9×19 guns, but it’ still plenty easy to get your hands on. As much as I love Glock’s, I have to concede that the Glock factory sights are a slight problem which should really be addressed sooner rather than later. With their typical front white dot and rear “u” outline sights, the Glock 38 and 39 feature the same standard polymer sights as most guns in the Glock family. It should be noted that there is nothing inherently wrong with these sights – they get the job done in most instances – but that doesn’t mean there is any excuse for standard issue Glock’s not coming equipped with sights which are as impressive as the rest of the gun. This problem is only magnified by the increasingly large number of third party sights which are becoming more and more impressive – Trijicon, in particular, makes excellent night sights that I personally install onto my Glock guns as soon as I can. You’re still going to be able to have a good shooting experience when using the G38 and G39 with factory sights, but upgrading definitely makes target acquisition and night shooting a lot more manageable. Hopefully one of these days Glock sights will be as high-quality of the rest of the gun, but until then, upgrading or managing with the factory sights isn’t so terrible. As we have touched on many times in our past Glock reviews, Glock takes gun safety very seriously, and this manifests clearly in the design of their handguns. Like the other Glock handguns, the Glock 38 and 39 feature no external safety levers on the frame or the slide of the guns – rather, they utilize Glock’s Safe Action System (and to great effect). 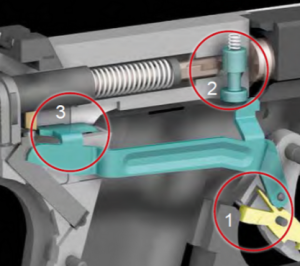 Between the firing pin safety, the trigger safety, and the drop safety, Glock has the three most vital safety risks of handguns covered in the G38 and G39 – firing pin malfunction, unwanted trigger pull, and accidental drops. 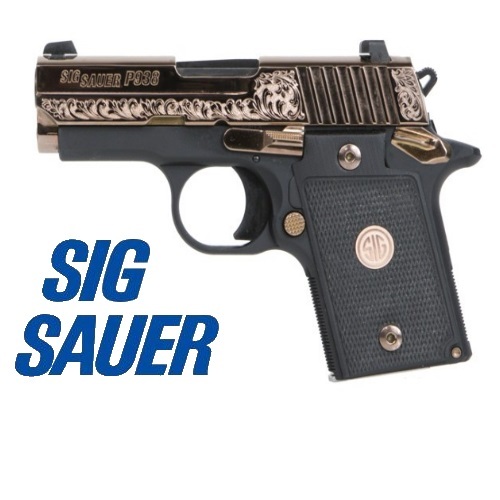 Having used both of these guns extensively, I can state confidently that I never had any kind of malfunction in the safe action system or felt any kind of safety risk – these handguns are as safe as one would expect when dealing with a Glock. Although the Glock 38 and Glock 39 don’t have quite as many ammunition options as their brothers in the Glock lineup, the classic variety of Glock accessory options are all there for the taking. From replacement sights (again, highly recommended), to lights, to grips, to cover plates, to holsters, to beaver tails, there are a number of great accessories to go along with your G38 or G39. Whether you want to improve on a shortcoming, modify your Glock, or just make it feel more like your own, here are my Top-5 Glock 38 or 39 accessories. Tactical Rubber Grip Glove: This rubber grip enhances the Glock experience by making gripping the gun an easier task with its non-slip finish. Recoil is also reduced by this easily installed grip glove which will work with your Glock 38. Pearce Grips PG-26XL Grip Extension: One way to make your Glock 39 grip a little easier to handle for those whose hands don’t agree with its form factor is by using a grip extension. 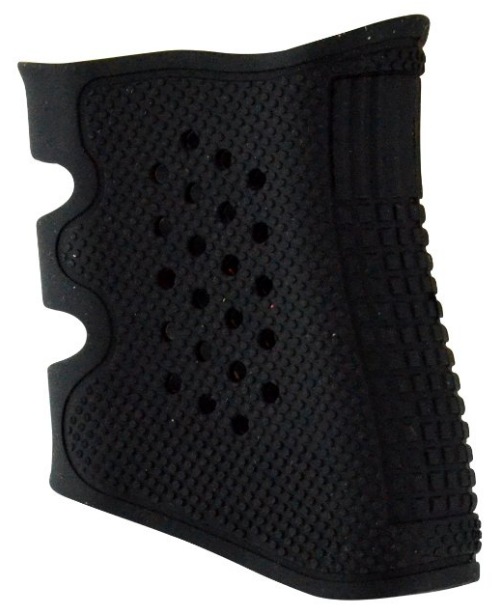 Made of high impact polymer, this Pearce grip adds another finger position to the bottom of the grip without compromising much on control, comfort, or concealability. 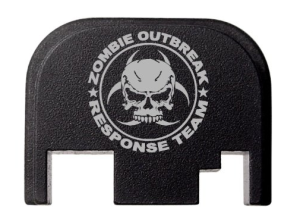 Back Rear Cover Slide Back Plate: In addition to some folks finding fault with the aesthetic of Glock guns, there are those who simply want more of a personalized feel to their Glock. Rear cover backplates are a great way to personalize your gun without messing with its function or workings, and there a wide variety of plates to choose from. 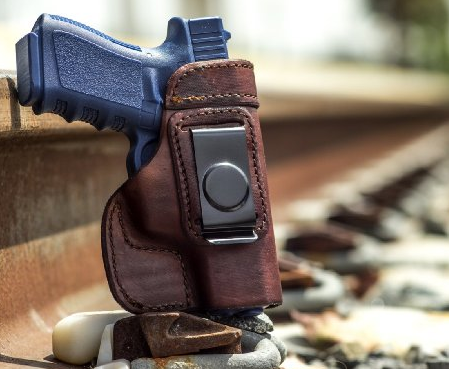 OutBags LOB2S-G19 Genuine Leather IWB Conceal Carry Holster: Given that so many people use their Glock’s for concealed carry purposes, it’s only natural to expect that a holster will make a great accompanying accessory. 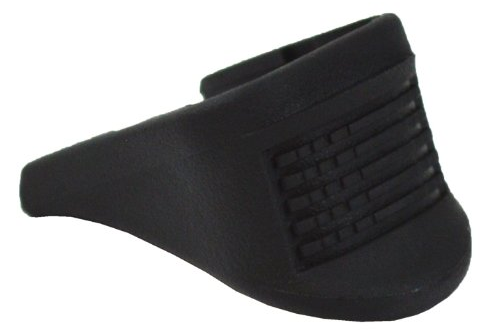 Inside waistband holsters like this great one from OutBags make concealed carrying your Glock 38 a breeze. BLACKHAWK! 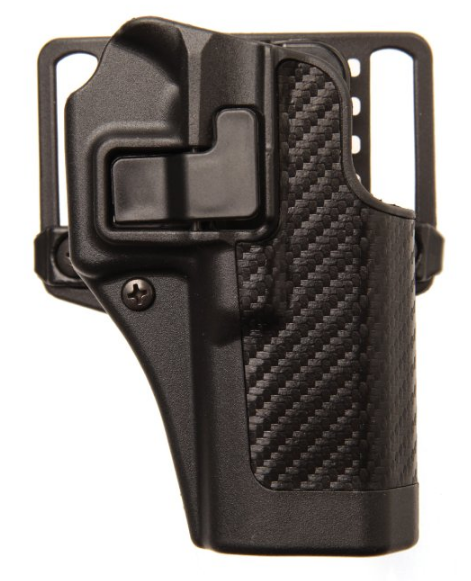 Serpa CQC Carbon Fiber Appliqué Finish Concealment Holster: For the smaller-yet Glock 39, this carbon fiber holster is a great option for concealed carrying (which is what most G39 owners are using their guns for – concealed carry self-defense). Is ammunition for the Glock 38 or 39 as easily procured as ammunition for the more popular Glock guns? No. Are the factory Glock 38 or 39 sights the greatest you’ll ever use? No. Are these two of the most powerful and effective .45 caliber-using firearms you are going to find? YES! The Glock 38 and 39 aren’t the world’s greatest guns by any stretch of the imagination, but that doesn’t mean that they don’t fill a very particular and important niche for gun owners. If you’re looking for the power of a .45 Auto cartridge in a gun that is small enough to conceal, with the build quality of Glock to boot – you’ve got to go with the G38 or G39! Be sure to see our features on the Glock .45 Auto line of firearms – the Glock 21, 30, and 36 – here at Gunivore!